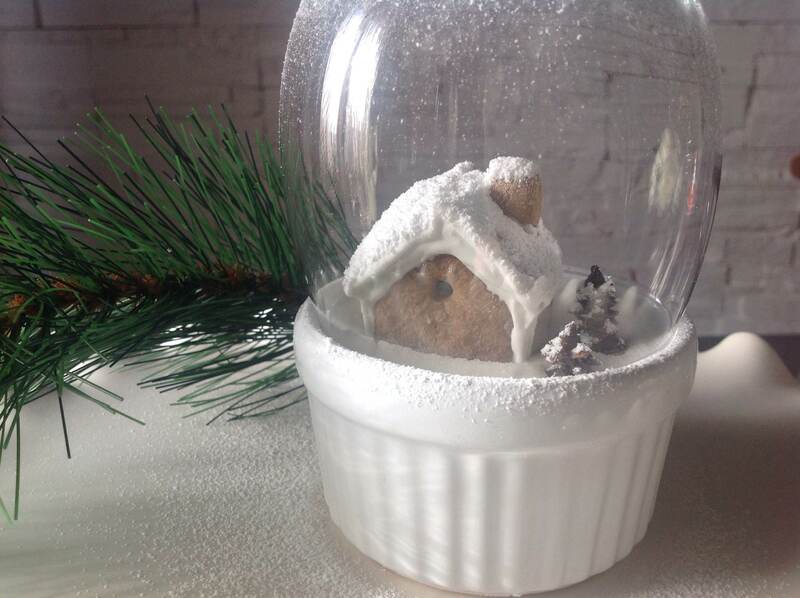 I had come across these snow globes a year ago. They stuck in mind they were so pretty. It probably was not even gluten free and I have no idea what the base was made of as it was in some foreign language. I still made it, using a delicious flourless moist chocolate cake recipe for the base and made the gingerbread house out of my gluten free gingerbread dough. It does require a little patience I must admit, but as usual, once you make the first one, the others will be easier! 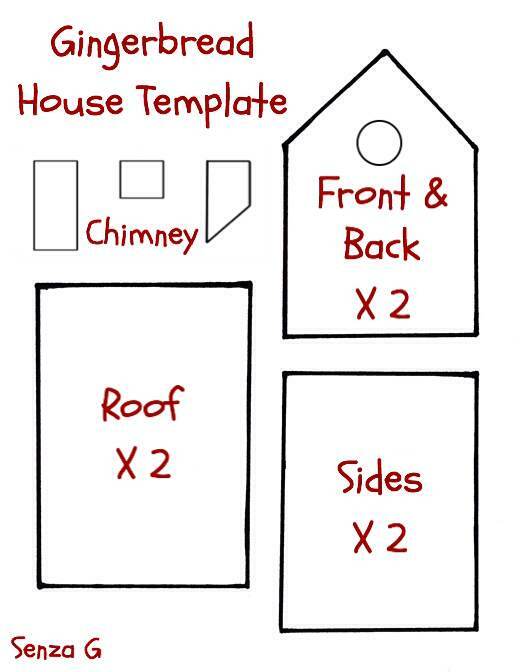 I have also made a template for you which you can print out so you can cut the dough around the pieces for your gingerbread house. My house was not as high as the template since my ramekins were small so I made it proportional. All you need is small white ramekins and round water glasses. For the gluten free gingerbread dough, I have revised last year’s recipe into a healthier version , made with almond flour and coconut flour. Everyone will love this, even non Celiacs! This version includes also chocolate. You can use this recipe to make this Gingerbread House, the Melting Snowman Cookies, Gingerbread Men and Christmas Cookies. So with the leftovers, you can cut it into whatever shapes you like! Beat in the egg, then molasses or syrup, then the melted chocolate. Add the flour mixture in three batches, incorporating well between additions. The dough will look more like thick mud, so do not panic. Scrape dough from bowl and wrap in cling film and refrigerate for AT LEAST 2 hours.Cut off half of the dough to work with, but leave the rest in the fridge, as it rolls better when chilled. Roll out the dough on a lightly floured surface to about ¼” thick. You can roll the dough between two pieces of parchment paper. Cut out in any shape you desire. Gently place cut-out cookies on a parchment-lined baking sheet. Repeat with the rest of the dough. Bake at 180C for about 5-7 minutes, mind you do not burn them. As I already said above, underlying the gingerbread house is a delicious moist flour less chocolate cake, recipe of which is below. Grease and dust four small ramekins with gluten free flour. Set aside. Place the hazelnuts in the oven to roast and when these are ready, pulse with a food processor. Put the butter in a small pan over low heat and then add the chocolate and cocoa powder. Stir until the chocolate melts and is smooth. Pour this in a large mixing bowl. Beat the egg white in another bowl, till peaks form. Set aside. Beat the egg yolks with the sugar and vanilla in a separate bowl and then add this to the melted chocolate. Combine well. Add the chopped nuts, the starch, a pinch of salt and finally fold in the beaten egg whites. Pour the cake batter into the prepared ramekins and level the top. Put in the oven and bake for 10-15 minutes, until the top of the cake is dry. Leave them to cool completely before dusting heavily with icing sugar. Cut out the shapes for the house out of the gingerbread dough as in the enclosed template. You have to calculate that the houses should approximately be 3 cm by 4 cm. As already stated, I made mine shorter since my ramekins were small. To assemble, just use Icing to put together. It is kind of fiddly, but as I said, it is only until you make your first one! Leave to dry completely. To make the trees, I used two mini daisy fondant presses to cut the gingerbread dough and piled them on top of each other, to form a tree shape. Or just make a plain cylinder shaped tree. You can leave them out if you wish, it will still look lovely. You can prepare the houses and trees beforehand, stored in an airtight tin. 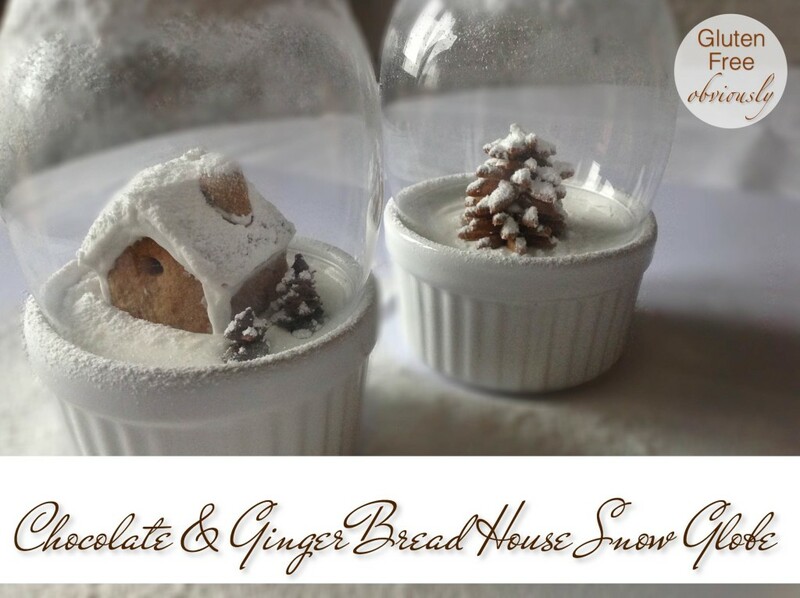 Place your little assembled gingerbread houses in the middle of the icing-sugar-topped mini chocolate cakes and place a couple of gingerbread trees on the side, if you made them. Dust lightly again with icing sugar and then place the round tumbler over it. Dust over the tumbler again if desired. Serve and watch your guests’ faces! I guarantee you that they will always remember your dessert!